Via: vulture.com by Patti Greco: After a two-year slump — also known as Lumen and DDK — Dexter returned to form with a seventh season that was not only entertaining but also ballsy. Haters are gonna hate, but come on: Deb finally caught Dexter; Dexter fell in love; LaGuerta realized Doakes was not the Bay Harbor Butcher. And, in last night's finale, Deb murdered LaGuerta! What more do you want? Vulture spoke to Scott Buck (who took over as showrunner last year) to go over some of the finer points of this season and talk about what's next for the series. Last season ended with a cliffhanger, but this season there was a definitive conclusion: LaGuerta is dead, Deb killed her, life as the Morgans know it is over. It seemed like a fitting way to wrap a season that was overall much faster-paced than usual. Were you giving viewers what they wanted in that respect — a quicker pace? Did knowing that next season is your last help? It might be the last. That hasn’t been announced yet. We’ve been picked up for one more season, but whether that is the last one or not has not yet been determined. Oh. Do you think it should be the last? Well, honestly, because we were picked up for two seasons, and the understanding was it may be the last, we’re certainly moving in that direction. But until Showtime tells us one way or another we’re not making any more definitive decisions. But the next season’s going to air this summer, right? So how far along are you in writing it? We’re just beginning to write stories at this point. Okay, I don't want to bog us down with timelines, but when will you find if it's the last season? Because doesn’t that impact how you'll write the current season? Do you know how the show will end? Oh, absolutely, I know how it ends. But whether it’s this season or the next season or further down the line will remain to be determined. Michael C. Hall said in an interview with Salon that Dexter can’t walk off into the sunset at this point, that he has to get caught in some capacity. Do you share that feeling? Dexter is a serial killer and serial killers only end in so many ways, and none of those ways seem to be particularly happy or encouraging. I think if we’re true to who Dexter is, we’re not going to end with Dexter walking off into the sunset. Serial killers are also sociopaths, which means they can’t really love. Yet this is the first season we hear Dexter tell a woman that he loves her, and he even acts accordingly. What made you go there? It was very much a natural progression over the years. I think, in particular, this was the year we wanted Dexter to become more of an adult, accept responsibility for who he is, but we also wanted him to perhaps explore love in more of an adult way. But even then he’s very immature as far as a relationship goes, so we had to try to put ourselves in his mind of what it’s like to fall in love for the first time and to not even recognize those feelings initially. He knew he was drawn to Hannah in a very strong way, but he didn’t even fully understand what that meant. He talked a lot about her seeing him for who he truly was and accepting him for that. Did he need to be with another killer for his relationship to actually make sense? I don’t know if she had to be a killer, but she had to understand and accept that aspect of him, and because Hannah herself had killed, there was clearly no judgment on her part. Whereas I think if anyone else were to find out that about someone they were attracted to, would certainly walk away. Was having Deb kill LaGuerta a way to bring her and Dexter closer for next season, because now she is a killer, too? Whether it brings them closer or pushes them apart will be the story that we’ll be telling next year, because it certainly bonds them but not necessarily in the most positive way. You could have written the ending differently — have Deb leave the room and let Dexter kill LaGuerta, for example. Why was it important to have her kill LaGuerta? I think the story that we were telling for Deb this year was about, once she decided not to arrest Dexter in that church, it put her on a very dark path. And if you’re going to side with Dexter, this is ultimately where it’s going to lead you. 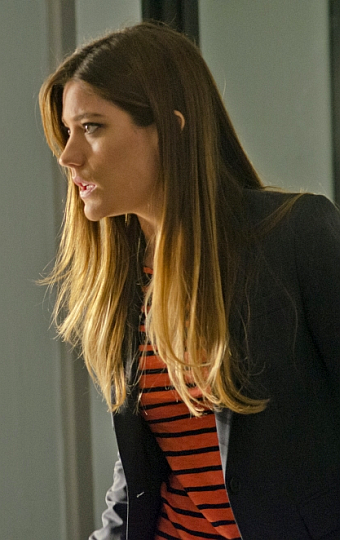 What was Jennifer Carpenter's reaction to the finale script? Because Deb was always on the right side of the law, so I’m wondering if she reacted negatively. Well, she was — she was well aware of where the story was going from the beginning of the season, so it was certainly no surprise to her, but it was also, she absolutely knows who Debra is better than anybody, so to see her character through this and to have to act this, I think it was very difficult for her. It’s a lot to deal with. Was there concern that this was out of character for her? I don’t think we felt it was out of character because unlike any kill that Dexter does, this one was done out of love to protect someone that she cared about. Whose idea was it to have her hug LaGuerta after she shot her? That was intense. That was entirely Jennifer’s idea. What we did was just, you know, after the scene essentially ended on the page, we just let the cameras roll and the actors were aware of what — that we were going to be doing that — so we just let them see where the characters would take us. There was backlash last year to Deb being in love with Dexter. And at first, I was very uncomfortable with it, too. Yet the end last night’s episode, I found myself wanting them to be together. Was that an emotion you were hoping to evoke? Is a romance between them still on the table? I think Deb’s feelings for her brother are extremely complicated and always have been, and this only complicates them further. I don’t think she’s going to suddenly stop loving her brother, but I think she all along knew the romantic relationship between the two of them was sort of impossible, and I think this will just make it potentially that much more difficult. And I think the more she gets to know her brother, the more her feelings toward him change and evolve, so I’m not sure at the end of this season if she harbors any romantic feelings for Dexter. I would kind of think not. Other than LaGuerta and Doakes, Quinn was also suspicious of Dexter. Was the fact that he had that scene at the end with Dexter’s nanny meaningful to next season? I think it’s meaningful. Quinn is someone who has always, early on, had his suspicions about Dexter and he took them on as long as he logically could at the time. I don’t think he completely dismissed them, I think he still has some thoughts about Dexter; I don’t think that he believes he’s a serial killer in any way, but I think he believes there’s something a little bit off about this character — or, at least, there’s something about him that he doesn’t fully understand. So that’s something that we really have to keep in mind when we write this character. So that might come back around next season? This season was really about how much Dexter has changed since the beginning of the show, about him abandoning the Code. And by the end of last night's episode, he’s out in public in his kill clothes. Does this mean his two lives are now one? Is the Code gone for good? No, I think he’ll have to return to the Code, because it’s really all he has. But yet, the Code was originally Harry’s, and now Dexter has sort of taken it on as his own, so it is something that can expand and evolve over time as well. I mean, I think he’s already modified it somewhat this season. It’s clear that LaGuarta was outside the code, but when he killed Hannah’s father, I think in his own mind, that was an acceptable kill. It seemed like a stretch that Hannah wouldn’t rat Dexter out after he turned her in. Is that because she knew she’d rather escape and get her revenge on him the way she likes to, by killing him? Or is your thinking that she really loved him that much? I think she really loved him, and I think she had no proof on Dexter. It would sound like something out of desperation, so it probably would not have helped her. I think she still loves him very much but hates him at the same time. And can we expect to see her back next season? As an enemy to Dexter or an ally? As I said, she both loves and hates Dexter, so it’s not going to be that simple. Season six wasn’t totally well-received, but there was a pretty positive response to this season. Now that you’ve had some distance from six and some feedback on seven, do you have any theories on why this one worked out better? And is there anything you would’ve done differently on six? I think the season just focused more squarely on relationships; we were not afraid to pull out some of the big guns and do stories that we had been wanting to do for quite a while, whereas I think in season six, I felt like we were in a little bit of a holding pattern, we were afraid to take any big leaps forward with the show. Is there anything you would’ve done differently in particular? I don’t really want to revisit season six. I mean, it is what it is and I’m ultimately happy with it — I think we did a good year. I understand there were some people who didn’t think it was their favorite year, but well, it’s done. Do you think that a show like Homeland has been a game-changer in terms of how quickly shows have to move now? I don’t know. It feels like there have always been very fast-paced shows, and that’s a matter of taste and, you know, it certainly worked to our advantage, I think, just to tell the story really quickly, keep the energy up. I have a few more odds and ends. A recap commenter brought up a good point: Wouldn’t there be blood on Deb’s dress from when she hugged LaGuerta. So how could she have showed up to Batista's party after that? I think we saw a very minimal amount of blood on her. Is the plan still to make it look like Estrada killed LaGuerta? I think Dexter will stick to that plan because it’s all pretty much set up. Okay, last one: Why does Dexter often wind up with pretty blondes who have been abused by men? [Laughs.] That’s a good question. You’ll have to ask our shrink that.